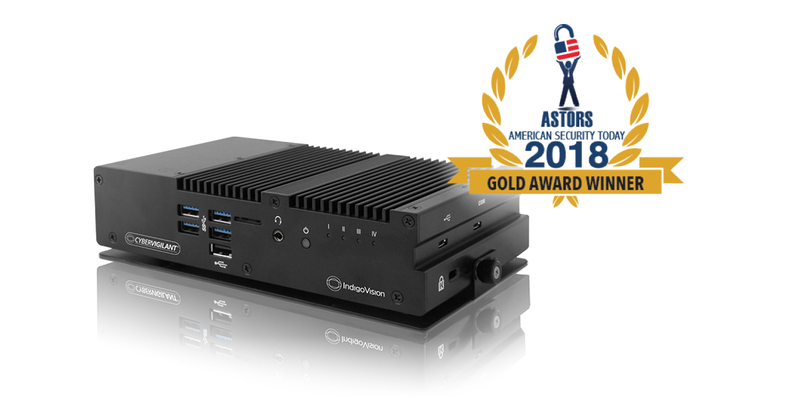 IndigoVision are delighted to announce that our innovative cyber-security solution CyberVigilant® was honored with the “Gold ASTORS Award” for “Best Cyber loT Management” at ISC East in New York City, on the 14th November 2018. The award was announced during American Security Today’s 2018 “ASTORS” Homeland Security Awards Presentation Luncheon at ISC East in New York City at the Jacob Javits Convention Center. The Annual ‘ASTORS’ Awards is a prestigious program that highlights the most cutting-edge and forward-thinking security solutions coming onto the market today. The program is specifically designed to honor distinguished government and vendor solutions that deliver enhanced value, benefit and intelligence to end users in a variety of government, homeland security and public safety vertical markets. “As the nation continues to respond to escalating threats from home and abroad, the innovative solutions being implemented to meet those threats, have led to tremendous growth in the field of Homeland Security,” said Michael Madsen, co-founder and publisher of American Security. ‘ASTORS’ nominations are evaluated on their technical innovation, interoperability, specific impact within the category, overall impact to the industry, relatability to other industry technologies, and application feasibility outside of the industry, ” according to Tammy Waitt, co-founder and editorial director of American Security Today. IndigoVision first released the unique and innovative cybersecurity offering, CyberVigilant®, in early 2017. After the successful launch of CyberVigilant®, IndigoVision decided to take cyber-security technology to the next level by releasing CyberVigilant® in Camera. Building on over two decades of experience in the Security industry, IndigoVision’s CyberVigilant® technology is your answer to potential cyber-attacks. Full list of award winners can be viewed here at the American Security Today website. To find out more information about IndigoVision’s award winning CyberVigilant® technology and the rest of our innovative end-to-end security solution contact us now or arrange a meeting with an IndigoVision expert. next post: 2018 has been a great year for IndigoVision!